Packed with warm, comforting cinnamon, nutmeg, allspice, and cloves, the spices in this super-moist banana cake just get deeper and richer with time. Living in limbo isn’t quite as hard as I thought it would be. It’s sort freeing, actually. My guy helped guide my perspective – “it’s an adventure!” – and for the most part, I’ve gone with that approach. For 31 days, we are not tied down to a thing! We own nothing! Well, aside from three full-size PODS stuffed to the gills with our furniture and household goods (where does it all come from?!). Yes, it’s stressful to be between houses, but so far it’s just been this low, ever-present buzz of tension, not gobs of hair-pulling, tears, screaming into pillows, and full-on panic. Fingers crossed it stays that way. This banana snack cake is one of the last recipes I made in our old house, and I’m confident it will be one of the first to grace the table once we’re settled into our new place. I don’t know what it is about banana snack cake, but this version has been on my “to develop and blog” list for upwards of a year now, probably longer. There’s just something about banana cake that I adore. It’s homey, comforting, uses up those goshdarn overripe bananas, and couldn’t be more perfect for serving to the kids when they get home from school on a drizzly afternoon. Except I’ve only got one kid and she’s several years away from school, but please go with me here. It’s just that kind of cake. It’s also perfect for making a house feel like a home, so I can’t wait to stick a pan of this into our new oven and let the smell of bananas, cinnamon and allspice waft about our shiny new kitchen. 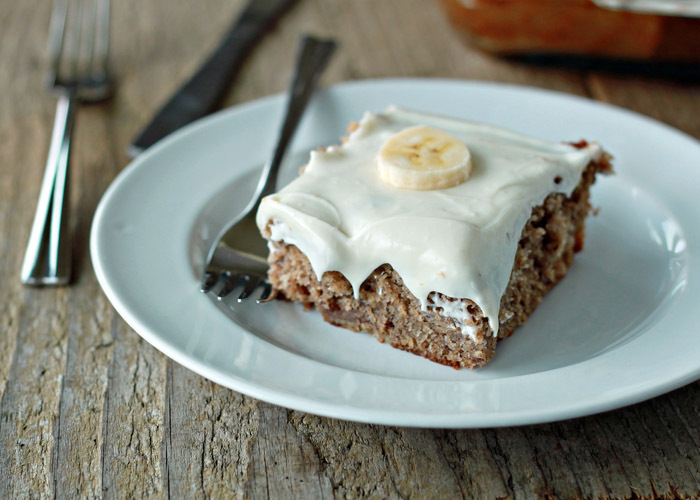 This cake brings bananas and spice cake together in perfect harmony. 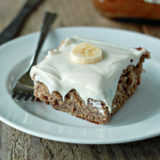 All the spices that go into spice cake – cinnamon, nutmeg, allspice, cloves – also happen to go stunningly with bananas. It a combo that was meant to be. This is one of those wonderful snack cakes that keeps in the fridge and every time you pull out a piece, you notice that the flavors are deeper, richer; the cake even more moist than the time before. 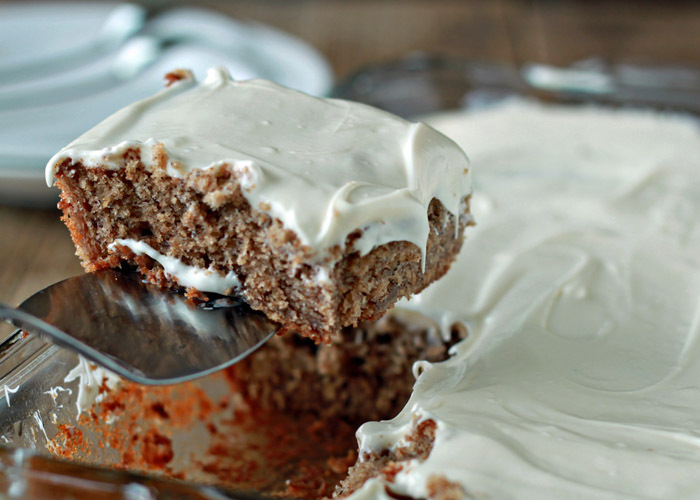 The cream cheese frosting contributes just the right amount of sweetness, tang, and sinfulness. I’m glad I finally got around to making this cake, and at such an appropriate time. It’s one of those baked goods that just feels like home – even more so during those times when you don’t really have one. Preheat the oven to 350 degrees Fahrenheit. Butter and flour a 13-inch x 9-inch baking pan. In a medium bowl, stir together the flour, baking soda, baking powder, salt, cinnamon, nutmeg, allspice, and cloves. Set aside. In the bowl of a stand mixer fitted with the beater blade attachment or in a large bowl using an electric mixer, beat together the butter and sugar on medium speed until pale and fluffy, about 1 – 2 minutes. Add the eggs one at a time and mix until well incorporated. 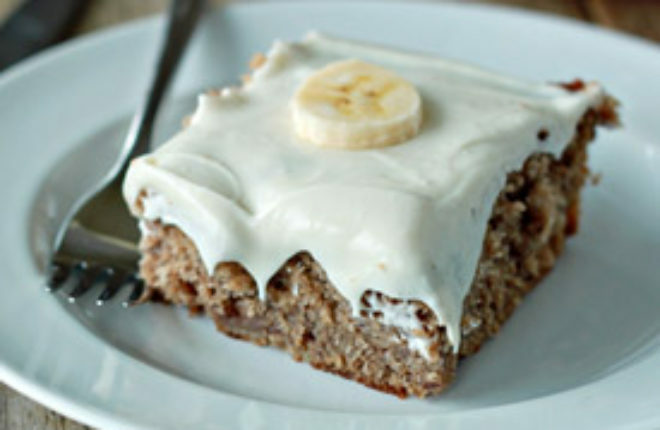 Mix in the sour cream and the bananas. Pour in the flour mixture, a little bit at a time, beating continuously until well-incorporated. Bake for about 25 minutes, or until the top of the cake is golden and a toothpick or tester inserted into the center comes out clean. Remove the cake from the oven and place on a wire rack to cool completely. To make the frosting, fit a stand mixer with the beater attachment or use a large bowl and an electric hand mixer. On medium speed, beat together the cream cheese and butter until smooth. Turn the mixer to low and gradually add the powdered sugar. Once all the powdered sugar has been added, increase the speed to medium and beat for another 30 seconds. Add the vanilla and pinch salt; beat for another minute or so until smooth. Add a little milk (a couple of teaspoons at a time) if the frosting seems too stiff to spread. 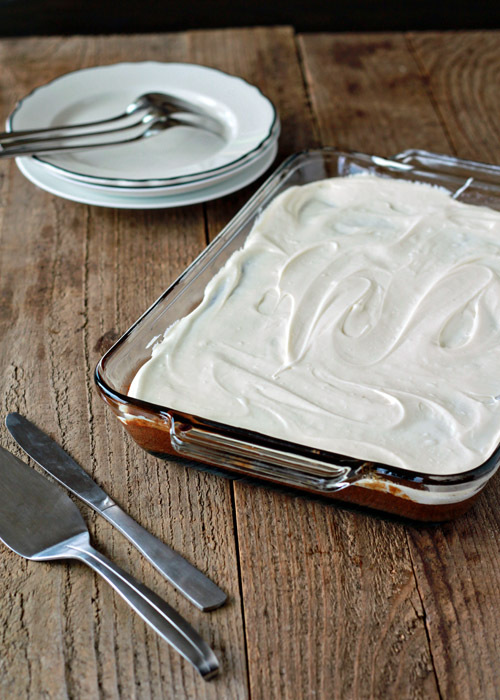 Spread frosting onto completely cooled cake. Cut into 12 pieces and serve. Cover and store leftover cake in the refrigerator; it keeps well (and keeps getting better) for 3 – 4 days. I think it’s all those cozy warming spices that make breads and cake like this so comforting! I love anything banana, so I’m excited to give this a try! And good luck w moving. Gotta me one life’s hardest things! It says in directions add eggs 1 at a time, but doesn’t say in the ingredients any eggs?? I’m in the middle of mixing right now?!?!? How many eggs?? Oh my gosh, I’m so sorry! 2 eggs. My husband loooves this moist cake!! The in-laws are headed over tonight so I can’t wait to see what they think. Thank you! Hi Carol! I’m so glad you liked it! And thanks so much for the substitution information – good to know! Probably a bit healthier with homemade buttermilk in lieu of the sour cream, too. Merry Christmas to you and your family! First I am minutes away from making it for the first time. And the cake, OH SO YUM ! Just had a question , how do I store the cake for a few days? Is it okay leaving it out or does it have to be refrigerated ? Wonderful! So glad you liked it. Happy birthday to your dad! Hi! I made this recipe for a Memorial Day weekend picnic and everyone went crazy for it and gave it two thumbs up! I love how moist the cake came out (something I have problems with sometimes when I make banana bread). The frosting was delicious too. My only comment is that the quantities for the frosting seemed to make way more than I needed. I thought I was very liberal with the frosting, but I only used half of it. Otherwise, this recipe is perfect!